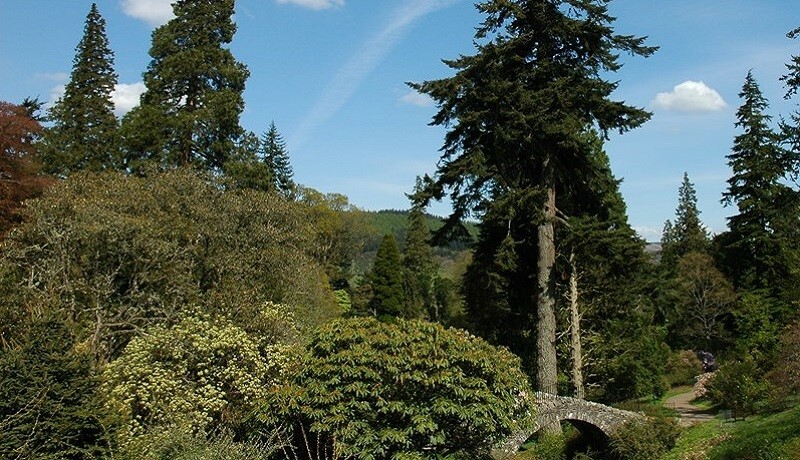 With trees that seem to reach into the sky forever, Dawyck Botanic Garden in Peebles is a 65-acre garden bursting with leafy woodland, gurgling burns and seasonal snowdrops, bluebells and more! It’s a botany adventure waiting to happen, and you can enjoy learning about plant explorers such as David Douglas (does the Douglas fir sounds familiar? ), and spot plant species from different continents, including Himalayan blue poppies. We know the outdoor environment can sometimes be a bit of a bumpy ride, so we spoke to Dawyck Botanic Garden about how they make their acres of trails and walks as accessible to as many visitors as possible. How long do visitors typically spend exploring woodland and burnside walks around the Garden? Visitors will spend up to an hour and a half typically exploring the Garden and its woodland trails. However in many cases our visitors will use the café to break up the visit and explore again after having eaten. The Visitor Centre has excellent provision for those with accessibility requirements and very helpful staff. Tip: There are accessible toilets in the Visitor Centre. How much of the Garden is accessible to wheelchair users, and how can visitors experience and learn about the tree collections in the parts of the gardens that aren’t as easy to reach? The Garden is vast [65 acres] and given the terrain, can be limited for those who are restricted by the need for a wheelchair. Around a third of the garden will be relatively accessible from more level ground. While the majority of the Garden is well served by hard surfaced paths, the limiting factor is the gradients of the slopes and in some cases, steps. There is a lot of literature available to our visitors in the Visitor Centre which explain the history of the garden and its tree collections as well as information panels out in the Garden. The studio also has a vast array of Garden films which give an in-depth look at the Garden from the comfort of the Visitor Centre. Tip: There is a pen, paper and magnifying glass at the Visitor Welcome desk! The natural environment has lots of obstacles! What kinds of things do you do to assist visitors with hilly terrain, protruding roots and poor weather? We tirelessly work to ensure as good a level and even surface as possible by keeping the paths clean and tidy and as free from obstructions as possible. Those wishing to use our accessible path are given a map to show the way and intersections are clearly marked by arrows and symbols to make it as easy as possible. How much seating is available to people to rest around Dawyck Botanic Garden? We have multiple rest stops, the garden is very well served by good safe stopping points and benches. Visitors will always find a suitable seat within a short distance. Do you have any tips for waymarking a clear accessible outdoor route? A logical and user friendly waymarking system with posts and arrows works well as does the provision of a clear map. It is important to use a readily identifiable symbol in a colour most suited to the broadest spectrum of people, including visually impaired visitors. Tip: Watch out for the foot mat at the entrance of the garden – it’s there to protect plants from external plant diseases! In the future, what kinds of things do you see Dawyck Botanic Garden doing to become even more accessible? We plan to increase the provision of hard surface path systems to open up more of the central core of the garden. In addition, the revision of some of the gradients will make access easier and safer.